How Can Schools Make Lunches More Appealing to Teens? California public schools serve 560 million lunches a year. In a place that also grows a lot of this country’s food, it makes sense that California kids would eat California meals. That’s the idea behind a new school lunch plan that rolled out in late October called California Thursdays. Fifteen districts across the state have partnered with the program, including the biggest, like Los Angeles and San Diego. Youth Radio reporter Maya Escobar samples one of the new California Thursday recipes, and goes over the benefits and challenges involved in overhauling school lunch. To respond to the Do Now, you can comment below or post your response on social media platforms such as Twitter, Instagram, Tumblr, Vine, Flickr, Google +, etc. Just be sure to include #DoNowLunch in your posts. School lunchrooms are sometimes called the biggest restaurant chain in America, and in districts across the country, there’s a push for healthier, locally sourced ingredients. Given the fact that childhood obesity has more than doubled in children and quadrupled in adolescents in the past 30 years, revamping school lunch menus sounds like a really good idea. But in practice, improving school lunch is harder than it sounds. The first issue is cost. School lunch is bound by federal requirements and a strict budget. And local, sustainably grown ingredients often cost more than standard school lunch fare. Some districts have dealt with increased food prices by serving more vegetarian meals. Others have limited their special menus to just a few times a month, rather than every day. The second issue is choice. 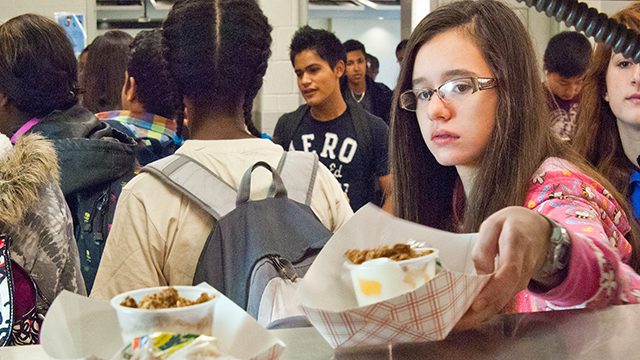 In some school districts, healthier lunch options haven’t gone over so well. For example, Michelle Obama’s school lunch agenda faced backlash from many school districts, students, and some politicians who resisted the federal government’s intervention around decisions around what schools offer their students for lunch, pushing her to defend the policy to Congress. In 2011, the Los Angeles Times reported that LA Unified School District, the second biggest in the country, launched a healthier food initiative. The district nixed chocolate and strawberry milk and foods high in fat and sodium, like chicken nuggets and corn dogs. Instead, they served healthier alternatives like vegetarian curries, tamales, and quinoa. While nutritionists praised the changes, local students were not so pleased. School lunch participation in the district dropped by the thousands, and school administrators said many students were simply throwing away their milk and entrees. In the end, the districts ended up cutting many of the new menu items and bringing back old student favorites, such as hamburgers and pizza (though reportedly swapping in whole wheat crusts). This past month, LAUSD was one of fifteen districts across California to participate in a new initiative called “California Thursdays.” One day per week, schools in these districts will aim to serve local and, if possible, sustainable ingredients. The program is just getting started, but food service officials seem hopeful that it will be a boon — for local economies and local students alike. In Oakland, one of the participating districts, 17-year-old Ayana Edgerly is a fan. “The food is way better in the cafeteria on Thursdays,” she says. For children across the country, returning to school means eating mass-produced lunches. But Oakland, California, is implementing an ambitious plan to transform their lunch program to provide healthier, locally-sourced food. Jake Schoneker and his student journalists at Media Enterprise Alliance report the story as part of The PBS Student Reporting Labs Network. Written by an English teacher in Kansas and performed by high school students, this musical parody video protest of lower calorie school lunches went viral in 2012. The song, called “We are Hungry,” features lyrics such as: Give me some seconds/ I, I need to get some food today/ My friends are at the corner store/ Getting junk so they don’t waste away. This KQED Do Now segment was produced in collaboration with Youth Radio, the Peabody Award-winning youth-driven production company headquartered in Oakland, California. This post was written by Teresa Chin at Youth Radio. yes..the schools are not makeing the healthly food in the canteen…its mainly affected the students.. Since I eat school lunch pretty often, I have a pretty positive opinion on the school lunch. I seen the improvement of the school lunches through out the years. I believe if the food taste good and was healthy it would attract more kid to eat the school lunches. I believe the push for healthier lunches has fail because of the cost since we made over 500 million school lunches a year. I think the lunch is pretty decent right now but it could use some improvement. I agree with your statement because I also eat school lunch and I find the food very appetizing. It has had large improvements over the years and they have also changed the standards of foods to more healthy alternatives. Although there has been a significant change in the foods being produced for school lunches, I hope they should have more choices of entrees for students to choose from. Schools can make their lunches more appealing to teens by maybe offering a special prize or award for eating school lunch at least once a week. I think teens are willing to eat healthier lunches because we are more aware of the foods we are digesting. I think they have failed because some teens are uncomfortable eating foods at school since they are not tasty. I feel like schools should find a way to increase their food budget so they can get healthy food that tastes good or at least decent. Offering a special prize or award for eating school lunch is wrong in my opinion because that is like bribing students to get school lunch and the money for the prizes or whatever you had in mind could be used to get better lunch possibly. If people were actually interested in the prizes they could just get the lunch for the prize and throw the lunch away if they wanted so there are a few problems with that idea. Teens would eat more school lunches if they tasted good but the problem is that it also needs to be healthy. There is some food that is healthy and tastes good but that is expensive so it is not really in our budget. If schools wanted teens to actually eat the school lunches the only way is probably a bigger budget, not sure how schools would get it but maybe they can find a way. I agree, food that taste good is usually bad for you but if we had tasty food that is healthy it would be too expensive. If we charge more for food that is good I believe people would still buy it. Youth Radio is the Peabody Award-winning youth-driven production company headquartered in Oakland, California. For more Youth Radio stories and lesson ideas, check out www.youthradio.org .